Exmap is utility that allow user to get information about real executed program's memory consumption. To obtain this information a special module for Linux kernel is used. Information collected by kernel module may be obtained by user via user-space utilities. For executable files, containing debug information, module can obtain information with symbol-level details, and for all other files(without debug information), information provided with section-level details. For analysis of collected data there are several programs. In Exmap's distribution there is gexmap utility, that provide access to information via graphical user interface. Besides this, there is also exmap-console tool, that allow to get information with command-line utilities, and allow to get access to information on remote host. After execution of these commands, user can start to use user-level utilities to get information about memory consumption. Exmap's distribution contain also gexmap utility, that used for graphical representation of data, collected by kernel module. Example of work with gexmap you can see on screenshot below. in second window you can see more detailed information about memory consumption in one of component of selected (in first window) program — memory allocation on heap, library loaded by program, etc. 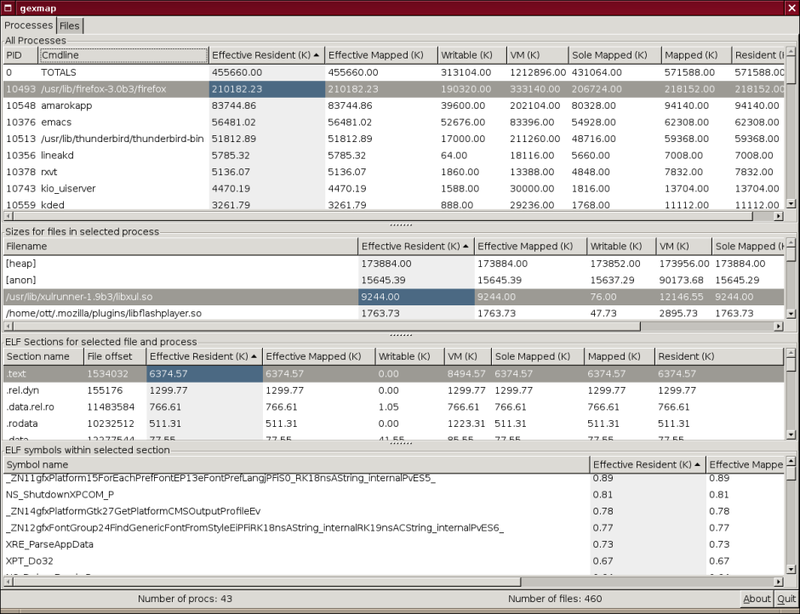 So, user can get information about memory consumption for all program, or for selected components and objects. Usage of graphical user interface not always convenient for developer. This was main reason for development of separate utility, called exmap-console, that implements command-line utility for retrieving information from kernel module, and also some programs for access this information on remote servers. Installation of this package is pretty simple — you need to download source code from project's home page, unpack them and execute standard build sequence (./configure ; make ; make install) to build & install this program. command-line utility, that accesses to kernel module and prints information in text form. This program can also be used in interactive mode. Besides this, exmap could be used to access to information on remote server, that executes the exmapserver tool. provide remote access to information collected by kernel module. is used to run exmap periodically and stores collected information in given directory. Detailed information about work with these utilities you can find in manual pages, distributed together with source code.